Venezuelan security forces attack trucks carrying humanitarian aid. Imagine the response if Venezuela tried to drive a caravan of “humanitarian aid” across the border in McAllen, Texas, Nogales on the Arizona border, or the crossing in California at Mexicali. It would likely resemble Bush the Elder’s Highway of Death in Kuwait. Meanwhile, there was an opportunity for Juan Guaido, the self-proclaimed leader of Venezuela, to partake in a photo-op. This was played up by Trump’s neocon national security adviser, John Bolton. He said earlier the next target is Nicaragua and its leader, Daniel Ortega. If you ever had doubt Bolton and the neocons are living in 1963 during the height of the Cold War, consider the following tweet. It looks like the situation on the border will devolve into violence and the US will use this to argue for military intervention, either by the US or in combo with Brazil and especially Colombia. The sanctions imposed on the country will take too long for impatient neocons. The incidents on the border crossings in Venezuela are a great propaganda victory for the US. 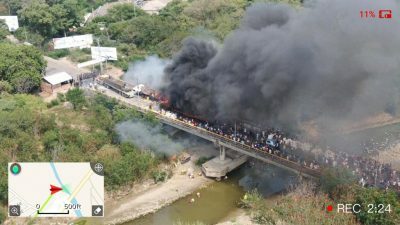 It’s not clear who is responsible for torching (and possibly bombing) “aid” trucks on the Francisco de Paula Santander bridge, but the blame was quickly placed on the Maduro and the Venezuelan military.